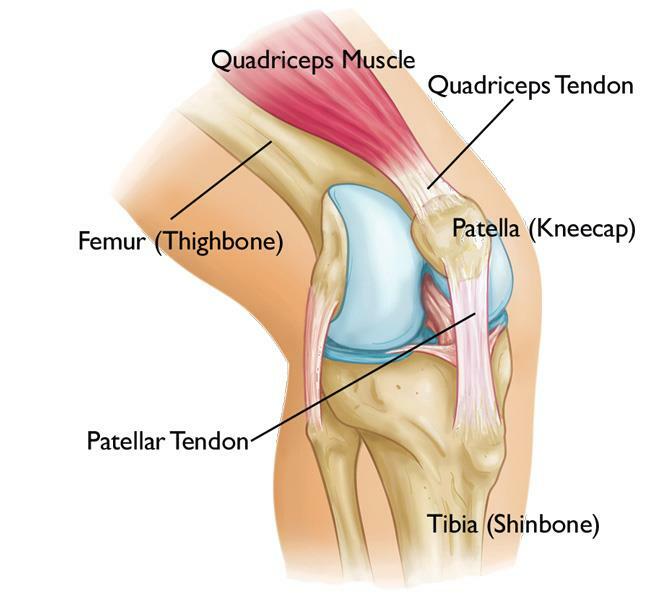 A teenager or young adult who is physically active and participates in sports may sometimes experience pain in the front and center of the knee, usually underneath the kneecap (patella). This condition—called adolescent anterior knee pain—commonly occurs in many healthy young athletes, especially girls.Adolescent anterior knee pain is not usually caused by a physical abnormality in the knee, but by overuse or a training routine that does not include adequate stretching or strengthening exercises. In most cases, simple measures like rest, over-the-counter medication, and strengthening exercises will relieve anterior knee pain and allow the young athlete to return to his or her favorite sports. The patella of this adolescent’s right knee is out of alignment and shifted toward the inside of her leg. Reproduced with permission from JF Sarwark, ed: Essentials of Musculoskeletal Care, ed 4. Rosemont, IL, American Academy of Orthopaedic Surgeons, 2010. In this x-ray of a bent knee taken from above, the patella is clearly out of alignment within the groove in the femur. Reproduced from Schepsis AA: Patellar instability. Orthopaedic Knowledge Online Journal 2003; 1(12). Accessed February 2014.